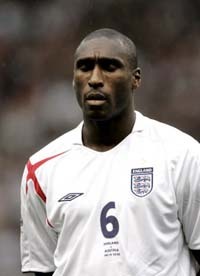 Should Sol Campbell get an England recall? What started as a new regime is starting to resemble an old school reunion in Steve McLarenâ€™s England camp. First, Becks was brought back from the brink and now it seems Sol Campbell could be making a comeback. Like Beckham, Campbell was cut from the England squad after Svenâ€™s 2006 Word Cup but a spate of injuries could see the one-man mountain getting a recall for this monthâ€™s friendly against Germany. John Terry and Ledley King are definitely out, there are the usual fitness concerns over John Woodgate and Jamie Carragher is upset at constantly being overlooked. After his funny turn at West Ham that paved his way from Arsenal to Portsmouth, Campbell has been impressive down south â€“ even if he was occasionally upstaged by Linvoy Primus. Desperate times require desperate measures, but weâ€™re not sure that Sol is still the player he once was and surely there are a new crop of young central defenders ready to be given a chance. At this rate, David James will be back between the sticks before long. All this recalling is a joke! What about Joleon Lescott? He deserves a go at it. AS much as I think Campbell is a good player, I think we should look at one of the plethora of young CB’s English football seems to have an abundance of. AS for David James coming back… could think of worse things. Although Campbell had a great season last year, so did players such as Lescott and Jagielka, both who are a lot younger with a lot of potential. Has David James not already had his chance?! Campbell may have had an excellant season last year, but then so did Lescott and Jagielka, both who are a lot younger with a lot of potential. Has James not had enough chances at international level?! pls don’t ever scare me again and link the words “England”, “Goalkeeper” and “David James” in one sentence again … i think i would do a Jack Charlton and find an Irish relation and change my nationality !! !